If you enjoy building things and working with your hands you definitely want to make sure you have the right tools to do it. A benchtop jointer is going to be one of those tools you definitely want to have, at least for a little more advanced projects. Of course, as with any tools, it can be difficult to figure out just which ones are the best. Which is why we’ve decided to make things a little easier for you with this benchtop jointer buying guide. Motor: Just how strong is the motor that you’re getting on the tool? A stronger motor is going to give you more power and more RPM, but it’s also going to make sure that the jointer isn’t working as hard to get the right performance. Speed: How many rotations per minute does it give you? More rotations per minute mean that it’s moving more quickly and gets the job done more smoothly at the same time. This is a good combination but you don’t necessarily need the fastest option. Cutting Width: How many inches is it able to work with? Your tool won’t necessarily be able to cut through absolutely everything out there so you want to know what it can do to make sure you’re getting what you need. Fence Stops: What degrees can you stop it at? This is going to affect the type of joints that you can get and it’s going to affect how easy it is to work on a variety of different projects. More fence stops mean more versatility. Size: How large is the tool and how much space is it going to take up in your workshop? You don’t want to get something that’s way too large for your available space. Whether that means you want the biggest option or something smaller. Warranty: A longer warranty means the company stands behind the product and believes it’s going to last. That’s always going to be a good thing for you and it’s something you’ll want to pay attention to when it comes down to it. Make sure you’re looking at several options before you jump into just one jointer. You don’t want something that is good for someone else but not for the kind of work you’re going to be doing. We’ve come up with a list of 10 of what we think are the best options, so take a look at these benchtop jointer reviews and see just what’s going to work best for you needs. 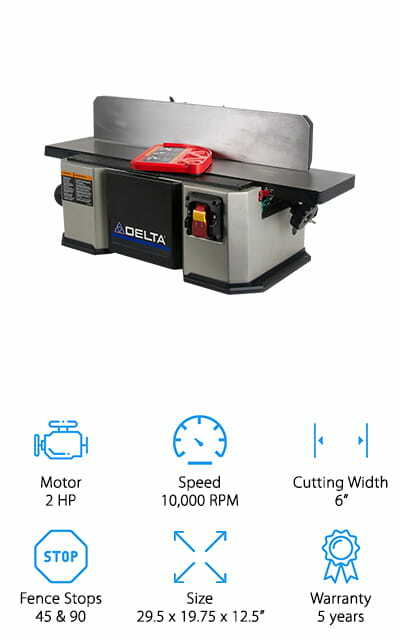 Moderately priced, our top pick Delta benchtop jointer is made with durable cast iron, which makes it heavier and more durable. In fact, the heavy construction means that it’s less likely to vibrate or move while being used. It’s also capable of precision machining and accurate work with simple fence adjustments to provide you the ideal stops for most projects. It’s able to stop at 90 degrees and 45 degrees both in and out and can cut up to 1/8” deep and 6” wide. All you have to do is set it on the table, hook it up and you’re going to be ready to go. The aluminum cutterhead has 2 knives and the jackscrew arrangement makes it easy to change out those knives as needed. 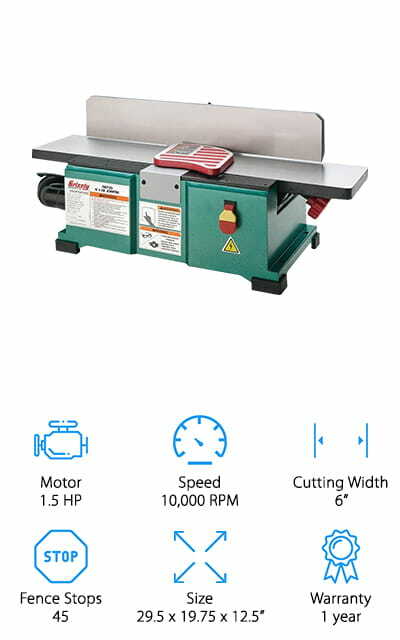 Made by a company that definitely knows what they’re doing when it comes to woodworking (with over 90 years of experience) this jointer comes with a 5 year warranty and offers 20,000 CPM and 10,000 RPM. Our budget pick Grizzly benchtop jointer is still going to get you plenty of features so don’t feel like you’re going to be missing out. It offers a 1 1/2 HP motor with 110 volts and is made entirely of cast iron for added durability and to cut down on vibration. It offers up to 10,000 RPM from the cutterhead and it can accomplish just about anything you might need. Even though it’s small it still has a lot of power but doesn’t take up too much space in your workshop. The center mounted fence offers plenty of strength and durability as well. There’s a 45 degree bevel adjustment and simple adjustment knives as well. It even offers a 2 ½” dust port and a built-in dust collection system so you don’t have to worry about the air you’re breathing while you’re working. You’ll be able to run just about any type of wood through our best cheap jointers. With this option of our best jointers for sale, you actually get options because it can give you rotations per minute of between 6,000 and 11,000, which makes sure it’s just right for what you’re cutting but not too much. There’s a two knife cutterhead that uses a jack screw knife leveling arrangement so you can make adjustments and replacements quickly and easily. The built-in cutter head lock helps with the process as well. Because the table is larger than some it provides more support and surfacing at 6” wide. You’ll have a center mounted fence to give you added support and edge jointing as well. There’s also a range of 12,000 to 22,000 cuts per minute and you can accomplish a range of different tasks from edging and flattening to face jointing. It has a moderate weight overall and works with boards as short as 10”. With a cast iron table and aluminum fence, this is definitely a durable option at a reasonable price. 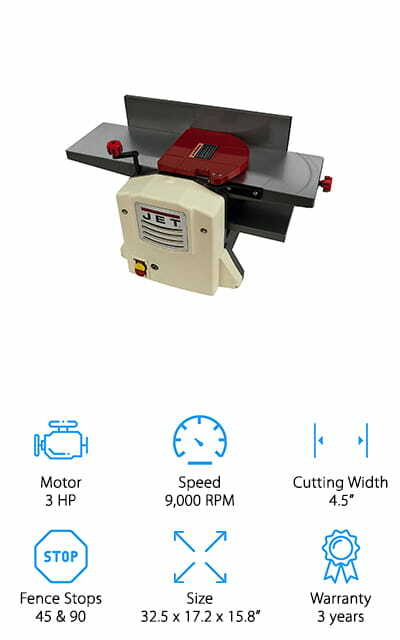 The low price on this benchtop jointer makes it a great option to check out and the fact that it’s made entirely with cast iron means that you can count on it to be durable and ready for just about anything you need. It provides a fence tilt of 45 degrees both inward and outward so you can get the proper cuts you’re looking for. It also includes a dust system built right in so you don’t have to worry about dust and debris getting all around your work station or in your way. 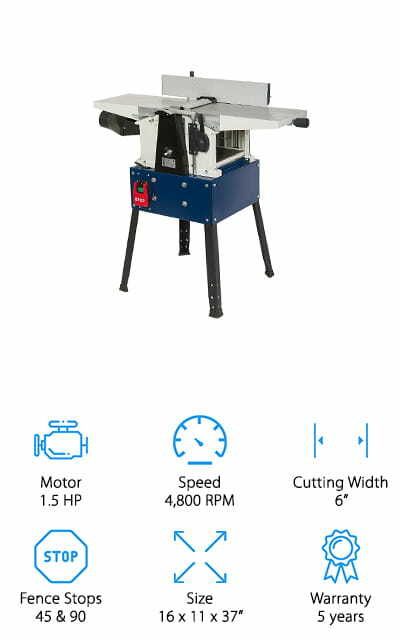 The 6” width and 1/8” depth capabilities mean that you can get just about any project completed with ease and the 1 ¾ HP motor can power it along for as long as you need. You’ll even get a 1 year warranty that says if there are any problems you can call and get it taken care of. 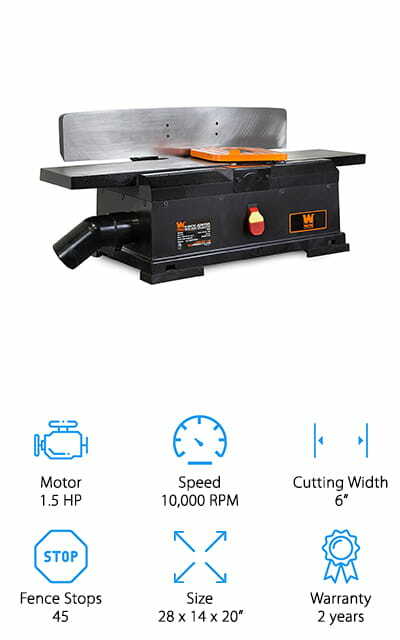 With this benchtop jointer planer, you’ll have a full table that can actually stand on its own, which definitely makes it a good option for many. With this table, you’re also getting a dust port that you can connect to your current dust collection system; a dual bevel fence and everything you need to get started using the system. It has a 1 HP motor that’s capable of providing plenty of power for just about any type of wood and it’s totally enclosed, which helps to cut down on dust getting in. There are fence stops at 45, 90 and 135 degrees to provide you with plenty of versatility and there’s a 45” bed, which can provide you with even more support than you would normally expect. It’s a heavy system but includes everything you’ll need, including a cabinet to store your tools in. It’s also able to cut up to 6 1/8” wide materials at a max of 1/8” deep. 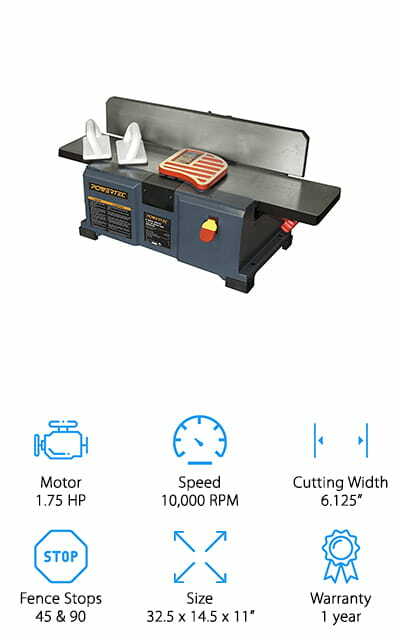 This large wen benchtop jointer table gives you a 10 amp motor that gives you up to 20,000 cuts per minute from the 2 blade cutterhead. The cast iron frame of the base means that it’s not going to move while you work and it cuts down on vibrations as well. Even better, it can bevel up to 45 degrees in either direction and comes with a 2 year warranty so you know you’re getting something that you can count on to last. Capable of cutting up to 6” widths, this system even comes with a filter bag, dust port, push stick and push block. That means you can stay safe and it also means that you won’t need to worry about dust and other debris getting in your way while you’re trying to work. For even more safety there’s a spring loaded blade guard that ensures the cutter is only visible when you’re working. 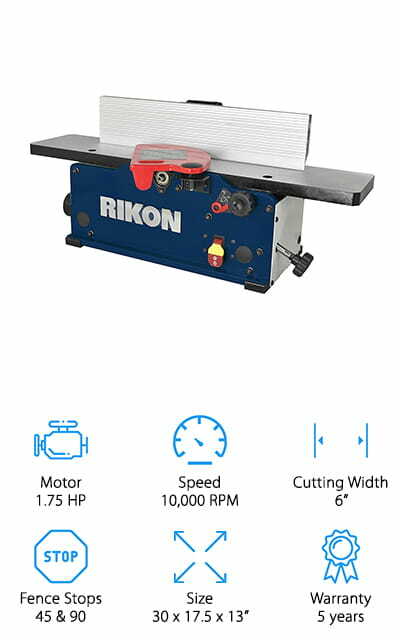 Here the Rikon benchtop jointer offers a helical cutter head that actually provides 12 2 sided inserts to get you even more cutting power. It provides fence tilts of 90 to 135 degrees and has a safety switch to keep it better for you and anyone else in the workshop. Made entirely with metal, including machined aluminum, it can cut a 6” wide piece that’s up to 1/8” deep with no problems. It even has a 2 ½” dust port that you can connect to your dust collector to keep things neat and organized. With this system, you get easy knife changes, a lightweight unit and all the pieces you’ll need to get some work done. It even has a scale and an adjustable fence for tilting. Plus you get a spring loaded safety guard that will keep it from revealing the blade when you’re not working. On top of all that you get a 5 year warranty. Made to complete your jointing needs as well as work as a planer, this is a tool that will definitely help you cut down on the amount of space you need but increase the amount of versatility. It uses a 13 amp motor that can provide 18,000 cuts per minute and feeds at 19 ½ feet per minute. It even has a sheet metal outfeed table that can be height adjusted to work with different sizes of pieces. The 2 steel knives that are used for cutting make sure that all cuts are precise and smooth. The knobs are easy to use because they’re designed to be ergonomic, fitting comfortably in your hand. You’ll be able to angle the fence up to 45 degrees to get more accurate joints and you don’t have to take up a lot of space to get this system to work for you and your needs. 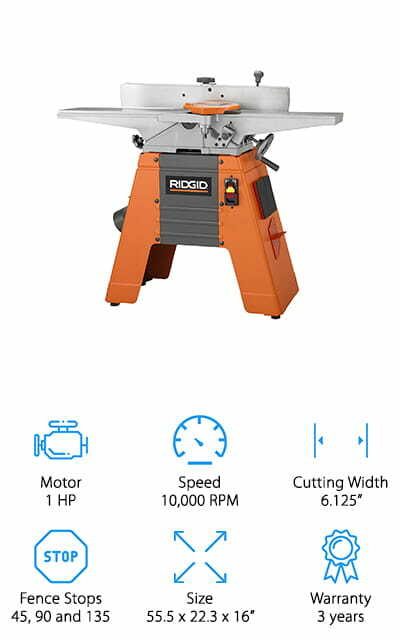 With our final option, you’re going to spend a little more money, but you’re definitely going to get the features you’re looking for with this jointer that offers a ribbed cast aluminum system and a 4” dust port. That means you’re going to have strength and durability, but you’re also going to have a lightweight machine that can actually stand on its own. The larger dust port makes it easier to keep all the dust and debris away from you and attach it to a collection system. 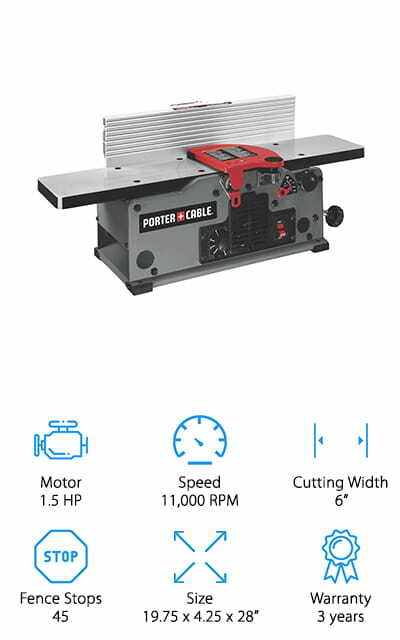 With the 1 ½ HP motor and the ability to cut pieces up to 6” wide you’ll be able to get a great cut every time. There’s very little vibration, thanks to the flat ribbed drive belt and the machine has a 2 ½” diameter cutterhead that actually has 3 knives built in. It can tilt to 45 and 90 degrees and can be used at 110 volts or 220 volts. You’ll get 4,800 RPM and 14,400 CPM for a whole lot of power in a small package. 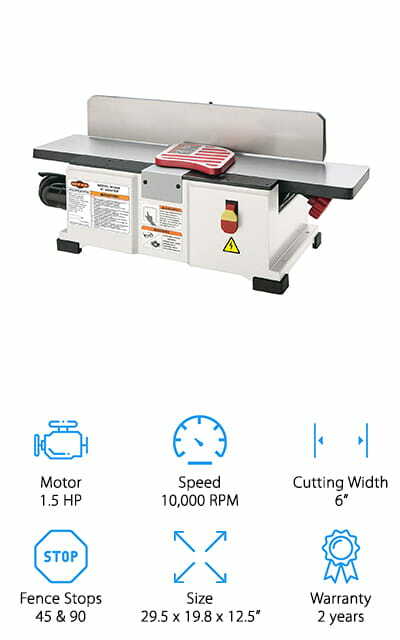 This moderately priced Shop Fox benchtop jointer offers a 1 ½ HP motor with 110 volts and 12 amps. The single phase motor powers the cutter head up to 10,000 RPM and 20,000 cuts per minute. There is a 2 knife HSS cutter head which offers clean and sharp cuts as well as providing you with durability and strength. When the cutters need to be swapped out you’ll have no problem switching them and you’ll definitely appreciate the fully adjustable fence that includes all the stops you should need. There’s a 2 1/2 “ dust port that helps you get rid of all the dust and debris so you can be comfortable in your workspace without having to worry about breathing it in. You’ll also get the safety push blocks you need to work and there’s a built-in dust collection fan and bag so everything is included together to keep things neat.